I work with two wonderful ladies, whom I think suffer unbearably in life; one is allergic to tea and the other is allergic to chocolate. They seem rather happy about their lot though, it must be said. In turn, they think I have an awful life because I am allergic to wine. And I don’t mean the “oh, it gives me a raging hangover” type of allergy, I’m talking about the full on throat swelling, muscle spasm type of allergy. And it bothers me greatly. It bothers me, because I’ve always wondered what it must be like to drink a really good bottle of the best wine and, more to the point, to understand what makes it a good wine rather than merely ordinary. Many people claim to be “wine experts” (and I’ve seen enough Saturday Kitchen to wonder if their main qualification is that they like a drink) but because I can’t drink the stuff, I’ve never pursued it. Does the flavour of ripe berries make a wine better than the taste of dark chocolate? I really wouldn’t know. The reason this is at the forefront of my mind is because I am currently reading about a group of particularly wealthy people who buy bottles of incredibly expensive, old and rare wines – and don’t drink them. Now to me, if you buy an expensive painting, it’s meant to be looked at, so you wouldn’t buy it and put it in the cupboard under the stairs where it would never be seen again. So if you are going to pay thousands of pounds for a bottle of wine, surely logic would state that you would drink it, wouldn’t you? I’m rapidly coming to the conclusion that logic plays very little part in oenophilia (the technical term for wine appreciation). The value of that bottle is in the fact that it has never been opened; air has not got into the bottle to taint the precious nectar inside. The dust and muck that collects on the outside is all very well, but the contents have to be untouched from the day they were bottled. So there are quite genuinely people in this world who pay unimaginable sums of money for a bottle of wine that is going to sit in a cellar until it gets sold on or – which would be poetic in my opinion – some ignorant philistine with a grudge decides to reach for a glass and crack it open. If there were true justice in the world, that would be when they find out it has turned into vinegar. One of the criticisms often levelled at Tolstoy’s War and Peace – and is also used just as frequently as an excuse not to read it – is that it is very hard to keep abreast of all the characters. This is not without some justification – there are a lot of princes, counts, generals and assorted others, most of whom have two names mentioned at any given time – but there are fewer characters than in most Dickens novels. Having read an awful lot of Dickens over the years, I think I may have worked out a useful solution. Well, it works for me. The trick that I’ve adopted in my re-read of Tolstoy’s first great novel is to list on a series of Post-It notes the members of the three main families – the Bolkonskys, the Rostovs and the Kuragins – and on two more, the key characters of military life, such as Denisov, Dolohov and Drubetskoy, and of civilian life, the main one of which is Pierre Bezuhov. Then as I go through the book, I can move the Post-It notes around so that I always know who is featuring in the chapter that I’m reading. Out side of these notes, everyone else is an incidental, if recurring, character and I don’t really try to follow their progress at all. After all, if I really wanted to know what happened to Napoleon, I wouldn’t choose to read about it in Tolstoy. Given that I’m currently a third of the way through the book, which in my edition amounts to almost 1500 pages – I’ve found this method quite useful in keeping tabs on who the various characters are and the changing alliances that they make as the novel progresses. Although I will always have very fond memories of the huge mind map I created when I wanted to keep track of the characters in Little Dorrit, read for my English Literature A level back in the 1980s. The book itself is very reminiscent of Proust in the sense that there is no real discernable plot; unlike Proust, however, a great deal goes on and some of the battle scenes are suitably chaotic, giving them a realism that may otherwise have been missing. If anything really jars with the book, it is Tolstoy’s frequent referencing of himself during the Battle of Austerlitz. Fortunately, he’s not a major character so I didn’t bother making a Post-It for him, especially as the representatives of the three main families were at that time trying desperately not to get themselves killed while Bezuhov was busy becoming a Freemason. I have to say, breaking it down like that does make it very easy to keep up. Remind me how useful I said it was when I lose track around page 1000. Dr Blake Does Art Crime! No, I’ve never heard of him either, but then I can be a bit of a philistine if it dates after Vincent van Gogh. Anyway, the upshot of this was that Blake’s mother, having been gifted a fine Davies by the artist painted over it – an act of revenge perhaps to highlight the situation of women artists at that time. This was discovered by accident when it was being removed to make way for an exhibition by… yes, you’ve guessed it, Davies himself. What a hoot. It was interesting to see Blake explore the painting, not only to find out who the model was (it was his neighbour, Agnes, who filled in the history of both paintings) but also to take an x-ray of it to see what lay underneath. This must have been the one of the earliest uses of x-rays in the art world, since the story was set in 1956! A nice touch, nonetheless. It was fascinating to see the art gallery “in action”, if you like – cataloguing paintings, moving pictures from one room to another, security arrangements for valuable paintings (insisted on by the Melbourne Art Gallery loaning the Davies pictures), and the storage for paintings not currently on show. There was a further question of who actually owned the painting, because the Davies was sold by Blake’s father, but the painting was “lost” (because it had been worked over). Blake’s father gifted all his wife’s paintings to the Ballarat Art Gallery. So who owns the painting – the gallery or the owner of the painting underneath? I’ve made this the subject of an art crime case study, which I’ll post soon. The murder aside (the victim was the girl who discovered what lay underneath Agnes’ portrait, and rather than report it, covered it back up – good girl), it was a fascinating foray into the world of art crime, courtesy of Dr Lucien Blake and his extremely talented mother. I think this is probably one of the most interesting Dr Blake Mysteries I’ve seen in ages. When are you going to put it on at a sensible time, BBC? * Okay, it’s not that recent, it’s from two years ago, but it was a welcome re-run. ** He is a very real artist, a Ballarat native and a member of the Heidelberg school. And I don’t like his paintings at all. I often catch the last ten minutes or so of “Fake Britain” when I start to get settled after doing the washing up and just before the start of University Challenge. I don’t usually pay attention to it – I’m not much of a fan of consumer programmes as a rule. But this one made me stop and watch carefully. I dislike real fur – except on the creature it originates from – so an expose on fake faux fur looked interesting. The programme took four anoraks with a trim which was advertised as fake fur – one of which was very similar to the one I doubt I’ll be wearing much longer – and had the trim microscopically examined by a specialist zoologist*. The results were revelatory. ALL of the four trims were made from real fur, in particular raccoon, rabbit, fox and dog. Yes, next door’s pet labrador could soon be on a raincoat near you. Unbelievably, the fake fur has been faked with the real stuff! I couldn’t believe what I was seeing. After a careful fondle of the fur trim on the hood of my coat (I’m 90% sure it’s fake, it’s got a distinctly synthetic feel to it when compared with the dog) I have resolved never to buy anything with any kind of fake fur trim ever again, just in case. Two of the coats came from reputable High Street stores who, it appears, were themselves misled by their suppliers. Unsurprisingly, Trading Standards are taking the whole thing incredibly seriously and will be conducting their own investigations. The moral of this story appears to be that if you care at all for animal welfare – and especially if you are vegetarian or vegan – there is no place in your wardrobe even for fake fur, unless you have specialist training in identifying fur and fibres, which I suspect the overwhelming majority do not. Without wishing to get into the politics of whether fur, fake or not, ought to be worn at all, this is a fraud designed to make money from those with a conscience and to me is even more reprehensible for that. I have to admit that I found it interesting, in its own appalling way, in an industry where margins are exceptionally tight and profits are everything, it is now cheaper to quite literally skin a cat in the name of fashion than to do the right thing and use a synthetic. Perhaps the luxury has now finally gone out of the fur coat once and for all. Either way, this report was a genuine shock to me and will be, I believe, to many others as well. * Although he might have been a vet, I missed that bit. Firstly, I found this story on the Decanter.com blog as part of a news item. I am merely interested in some questions the facts suggested to my mind; I have no wish to suggest that anyone mentioned in the news item was involved in any criminal activity whatsoever. If I fail in this regard, I apologise unreservedly. As far as I am concerned this post relates to a hypothetical situation and an interesting puzzle – nothing more. The Heidsieck** Monopole 1907 comes from a shipwreck. In 1916, Heidsieck Monopole shipped 3,000 bottles to the Imperial Russian Army aboard the schooner Joenkoeping*. But on 3 November 1916, the Joenkoeping was attacked and sunk by a German submarine. In July 1998, at the eastern point of the Baltic Sea, a Swedish submarine expedition found the wreck of the Joenkoeping at a depth of 300 ft and succeeded in salvaging 2,400 bottles. The key word in the article above is “salvaged” – this immediately explains that the retrieval was entirely lawful and there are no issues. But let us suppose that someone had gone diving, found the wreck and succeeded in liberating a number of bottles. What then? Allowing that my knowledge of maritime law is not great, I wonder if a shipwreck ought to be treated in the same light as an archaeological site, and consequently anything removed from that site could be considered looted. Therefore, that would mean the champagne recovered would be illicit; although if said diver went to an auction house and said “Look, I’ve got this champagne that my late father salvaged from a shipwreck, would you auction it for me?” I’m not sure what kind of authentication or provenance searches they could do to verify that it came from this shipwreck rather than that one, and was looted rather than salvaged, although I’d be intrigued to find out. The second question would then be – who was the legal owner of the looted champagne? I am assuming that there was a consignment note for the delivery to the Imperial Russian Army, so strictly speaking the champagne would belong to them. But as they no longer exist, would ownership then pass to their successors in title, i.e. the Red Army? I am not certain this question would arise in the event of a salvage, as ownership is one of the first things that is sorted out before the operation gets underway, but in terms of repatriation of my hypothetical looted champagne – where does it go? Unlike an antiquity, it would be pointless trying to offer it to a museum; should it go back to the chateau? Or would the auction house sell it as “vintage champagne, provenance unknown” and let the market decide? I don’t know. I genuinely don’t know. I’ve never given much thought about wine crime, antiquities looting and repatriation issues until I did this wonderful online course through Futurelearn on the subject***, run by Dr Donna Yates and others of the University of Glasgow. I think Dr Yates has inadvertently changed my life. I don’t blame her, I just wish I’d come across all this twenty years ago. I might then have a better idea of what I was thinking about. But for now, I shall enjoy speculating idly over a cup of tea and my knitting. * For some reason, I’ve forgotten how to do umlauts on my laptop. Sorry. ** I really must stop calling this “Hide and Seek” but it’s how I remember how to spell it. ***Antiquities and Art Crime. I believe it is running again in September. Highly recommended and completely free. What’s not to love? I may even do it again, just for the hell of it. I’ve finished The Moonstone now (and rather foolishly moved onto War and Peace, when I’m really not in the mood for it) and despite some misgivings about the rather convoluted way Wilkie Collins managed to make a guilty man innocent by removing the mens rea, or the necessary mental element of the crime, it was rather good. In fact, now I know what happened and how it was all managed, I might go back and re-read it to see if I can pick up the clues that I missed the first time. The epilogue, however, tells a slightly different but equally important story – the ultimate fate of the Moonstone. Suffice to say that the Indians succeed in their ploy, and this is discovered quite by chance by Mr Murthwaite, the adventurer, on another trip to India. Yet to me, this scene is extremely sad; for the three Indians get no reward for their efforts and are, in fact, banished from their god and each other for ever more. It seems such a heavy price to pay. There is a lesson in this, of course – isn’t there always? – and that is not to presume to understand such mysteries. That is a form of cultural imperialism I think quite honestly, India can do well without. It is clear that the three Indians were well aware of their fate and accepted it in their quest for the Moonstone. They do not try to obstruct or fight the banishment and accept it as right and proper – as do the rest of the congregation. Yet because we’re seeing all this through the eyes of a “civilised” Englishman observing the rites and rituals, the reader is left feeling that something isn’t quite right here – that it would never happen in England. I don’t know, it all sits wrong with me. Personally I think the final scenes are very sad and poignant and, in a strange way, possibly the best part of the book. Was the Moonstone really a diamond? There are a few things about this description which strike me as odd, but the colour of the stone isn’t one of them. Yellow diamonds are not unusual, their distinct pigment being caused by traces of nitrogen in the matrix (pure unadulterated carbon diamonds are colourless) and can vary between pale yellow to bright, vibrant canary yellow. 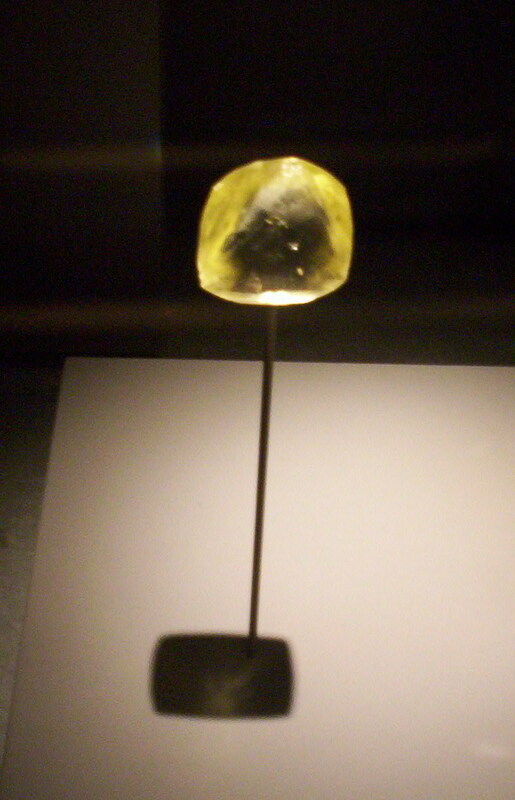 A number of very famous diamonds have been yellow – below is the Oppenheimer, the largest uncut yellow diamond so far found, currently in the Smithsonian. But neither of these diamonds are known to phosphoresce and Collins’ assertion that the Moonstone does puzzles me. Is this a hint of the stone’s background as a sacred item, by giving it an otherworldly power not shared by other diamonds, or just a plain old mistake? Thinking about it, I have wondered if in fact this was a canary kunzite. 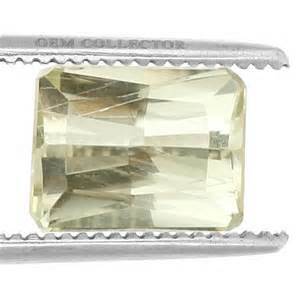 Although usually a pink stone, yellow kunzites have been found and it is very likely that in the Victorian period it would have been easily mistaken for a diamond by anyone who wasn’t a trained gemmologist. This is what one looks like. The fact also that the stone is looted would mean that it hasn’t been subjected to any geological or gemmological authentication, furthering the mistake. So as far as I’m concerned, the Moonstone isn’t a diamond at all. It’s a canary kunzite. As an aside, it is also apparently a loose stone, but Collins gets round this by having Franklin fashion a setting from wire to allow Rachel to wear it as a brooch at her birthday dinner. But a stone the size of a plover’s egg would soon outweigh a basic wire setting and would, I expect, be much too large to wear as a brooch lest it tear the delicate fabrics of an evening dress. It would need proper setting and would most likely be best worn as a pendant. That said, there is evidence elsewhere in the book that the stone is not actually faceted – so why wear it at all? Much as I love dogs, there is a part of me that really doesn’t like Crufts. It’s bigger than the part of me that doesn’t like horses or cows, but nowhere near as big as the part that doesn’t like the Grand National. I really don’t like the Grand National. And if recent reports are to be believed, the Kennel Club (who are responsible for the running of Crufts) are not the best organisation to be involved with. Last year, there was an allegation made by a dog owner that three of her prize hounds were poisoned by persons unknown, but probably a rival competitor. This year, there are assertions that a judge awarded a “Best of Breed” to a dog owned by her sister – without making it clear that there was a potential conflict at any point – and another of a German Shepherd with a deformed back and who appeared to be having problems walking. Something is clearly amiss in the world of the dog show. I’ve never liked dog shows, and my family have owned a number of pedigree dogs in our time. Yet all our dogs have been pets; only one, the Staffordshire Bull Terrier, was ever shown (by my brother) and, handsome though he was, he was the family mutt first and foremost. The Jack Russell pup was not well enough to be shown, had we ever considered it, and the Yorkshire Terrier and Chihuahua are a lazy pair with slight personality crises who love nothing more than fuss and a treat. There’s something unnatural to me to flounce up your pet’s hair, put it in bows, blow dry it to within an inch of its life and spend an absolute fortune on breath freshener and conditioner, then have it bounce around a small arena in a gait it isn’t used to, to then stand in a fixed pose while it’s poked and prodded by a pesky human. No. I wouldn’t like to do it so I don’t see why I should subject my pets to it either. The problem is that Crufts itself isn’t inherently cruel; it’s the people behind it who raise the questions. Is the rivalry so strong that contenders will, with an apparently clean conscience, take whatever steps are necessary to ensure that another’s dog doesn’t win (but theirs does)? And are the rules of the Kennel Club for breed types now so strict that the dogs themselves suffer unnecessarily? Many have heard of the bulldogs who cannot breathe because their faces are so squashed up, or their pelvises shaped in such a way that they can only deliver puppies through C-Sections. It is not confined to bulldogs, but each breed has its own issue where the selective breeding has now become so out of hand that the dog is no longer recognisable to one of a similar breed fifty or a hundred years ago. I personally have grave doubts about the stomach of the Kennel Club for keeping the best interests of the animal at heart whilst maintaining breeding standards. A dog can still be a bulldog if its face is a bit longer and its pelvis a bit shorter. The breeding standards for a number of breeds is appalling and bordering on cruel. I am sure that each and every dog that competes at any dog show is well loved, but really – does it have to look like that? Should The Moonstone have been in England at all? Yes, I’m reading Wilkie Collins at the moment. I have to say that after the Russian Revolution and all that went with it, it’s a pleasant change to read something with plot, characters and dialogue; and as I’ve not read anything like as much Collins as I feel I ought to have done, this is proving a real treat. This, however, does not go to make the theft – any of the thefts for that matter – justifiable. So I was pleased to see the successors of the temple watchers continuing their quest to have the Moonstone returned. One thing that Collins does do, and which is something of an oft-repeated trope, is to suggest that the stone is cursed, and will remain so until it is returned to its rightful home. I am sure that readers will recall the fabled Curse of Tutankhamun, fuelled by Lord Carnarvon’s apparently mysterious and ill-timed death soon after the tomb was found; not forgetting the so-called “cursed” crystal skulls. It seems to be something that although it may or may not exist, it is certainly believed – and Collins puts it to very good use indeed, although not being that far along in the story, I’m not going to discuss how it plays out. So, the question is, should the Moonstone have even been in England at all? As a clearly looted treasure, I do not believe that it should have been, and it should have been restored to its original home at the earliest opportunity. But having said that, if the Moonstone had been so restored, this wouldn’t be much of a novel, would it? Made in 1940 by MGM and directed by George Cukor, The Philadelphia Story is a somewhat Wildean comedy of remarriage; a couple divorce acrimoniously, she is about to marry someone else and when that falls apart, the couple remarry and live happily ever after. Here, Tracy Lord and CK Dexter Fletcher have divorced after he fails to meet up to her standards – despite being of the same social set and background. Some years later, she is about to marry a self-made man, George Kittridge, who – to put it bluntly – has no idea to behave and simply isn’t used to Tracy’s lifestyle. Somewhat camera shy, the proprietor of Spy Magazine has to resort to using Dexter, an ex-employee, to construct a ruse to allow two journalists (Macaulay Connor and Liz Imbrie) to attend the wedding and cover it for his magazine. Dexter, reluctantly agrees. As the film progresses, Tracy finds her feelings torn between George, Dexter and Macaulay and gets drunk on the eve of her wedding. Macaulay endeavours to protect her reputation but is spotted by George, who feels insulted and demands an explanation from Tracy the following morning. In turn, she feels insulted by his lack of faith in her, and calls off the wedding. However, as all the guests have arrived, Dexter steps in to reclaim the bride he lost all those years earlier. * Should any members of my immediate family be reading this, I want this played at my funeral. Please.